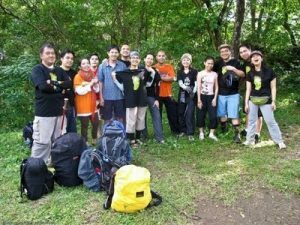 The groups conducting outdoor activities like hiking, mountaineering, cycling, mountain biking or horseback riding involves a series of checks to be carried out by the coordinators, monitors and guides the group. One of the most important is that carried out with a list or list of clients participating in the excursion. Potential health problems (diabetes, blood pressure problems, epilepsy, etc.) And dependence on medication, including allergies to stings, antibiotics, anesthesia. Mobile phone number, if available, or contact phone number of a close relative. All these data should preferably be included in a list or carry the Guidelines for the exits where the persons involved. In the numbered list group members in order to know (making a quick count stops or breaks) if they are all present. If a person is missing, the listing will enable us to take list and figure out who is the person who is not. The mobile phone number provided that in case of loss, you can contact the missing person. For the same reason, at least one of the guides should be in having a mobile phone, which is available to customers or participants in the outdoor outlet. If a person is lost before the References detected his absence, it could contact your cell phone drivers group. As the organization is concerned, this type of customer list is also useful to keep track of payments and any other incident to be recorded relating to a particular group member. For safety, all guides must have a copy of the checklist, duly protected from the weather. Thus, when we are in a situation where getting wet is not a priority, we will have some experience of how to avoid, and thus maximize our chances of enjoying an outdoor experience.